I was at the beach this past week. We were on a staff retreat to try and expedite the relational growth of our ministry team; when worded like that it sounds very UPSish … or maybe even cheap … but it was not cheap; it was a really great trip. I had all my stuff stolen, as was mentioned in an earlier post, right when I got to California, and part of that stuff was my digital camera’s battery charger. Thankfully the camera was not stolen and I was able to take pictures up until the end of the Pacific sunset our first night in Monterey. The battery died immediately afterwards. Either way, in the 30 minutes or so that we had on the beach watching the white/orange ball sink from the sky into the water I got to take about 100 pictures of the sunset and all the subsequent pretty things that a sunset does to water and sand and birds and people. This is the only way that I will ever take good pictures; expand my window of possibility that one of my shots will turn out nicely and make me look like a good photographer (I hope I didn’t just give myself away). In any event, a couple of my millions of pictures turned out really well (this may be thanks in part to the “sunset” preset on my camera). 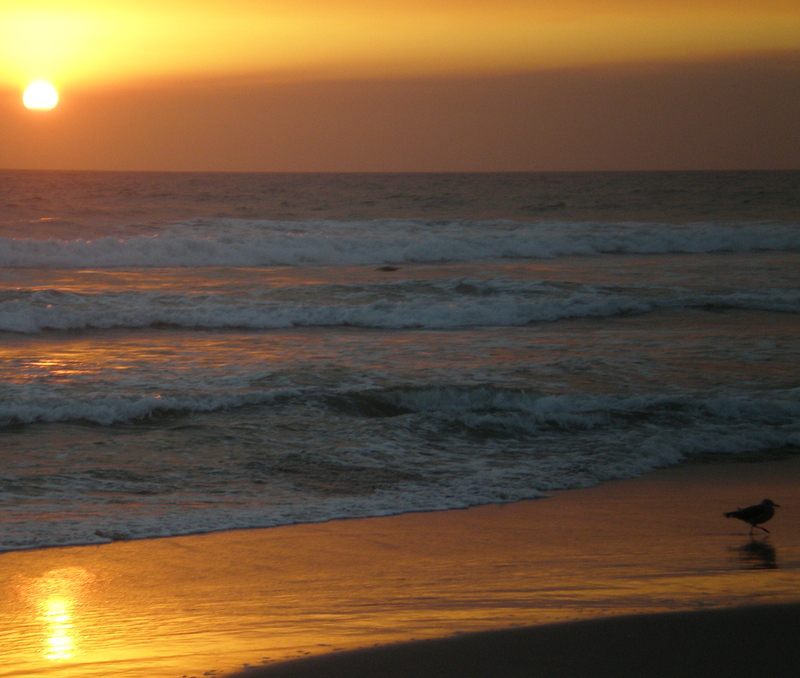 There are pictures of just the sky with this really pretty orange glow fading into darkness; there are others with the sky seeming to rest on the crashing waves, and even more of the water of the Pacific Ocean running up onto the sand while, at the same time, reflecting the light from the sun so that the water looks like liquid gold. I thought these were the most beautiful shots in the whole bunch … not definitely sure why … it’s difficult to explain beauty. And while those pictures are beautiful on their own (not to toot my own horn), there is this other, random element that could somehow add more beauty to the already indescribable scene. Every once in a while a seagull would wander into my shot … and the light reflecting off of the water would shine behind him so that the picture would come out as a beautiful evening on the beach, with golden waves washing up on shore, and the silhouette of this creature, which in most other scenarios plays the part of the nuisance. And the creature seems to make the beauty complete …. almost as if the light is using the creature to complete its work of art. In case my language didn’t already give it away, it would seem that there is here, as there is in all of creation, a picture of God … a picture of the Creator interacting with His creation … taking an otherwise squawking, less than perfect creature and using it to complete … to perfect … His masterpiece. The silhouette is significant. In creating a silhouette the silhouetted creature has its identity hidden … taken away by the greater light. But the creature is not lost; it is not made insignificant. It is rather used to have incredible impact on the bigger picture. Because of the light, the silhouetted creature acts as a perfect contrast to the world around it, standing out, not because of its own identity, but because it is a product of the light. As Christians, this is an incredibly beautiful, but also an incredibly helpful image that serves us as a reminder … we should stand out in some ways … we should be different. We should have an impact and we can be and will be significant. But the same source that created us created our significance so that if pride exists in us, we can be assured that it is a false-pride … one of which we are not worthy. The beings that we now exist as … you and I … are products of the light; a light that turns water to gold. And that is the only thing that we can take any pride in. ~ by Will Norman on September 13, 2007.